Hi, friends!! We had such an amazing weekend, and I hope you all did too. The Covington square has quickly become a new little spot for us. It's actually where the Vampire Diaries was filmed, incase you were also a fan ;) The town itself has done a great job of adding fun places to shop, eat and relax. Everything is so beautifully kept, and clean. Both the people working in all of the establishments, and visitors are all super sweet and kind.. we sure didn't find that too often in South Florida.. LOL. Anyways, I'm rambling here and forgetting the entire concept of todays post! 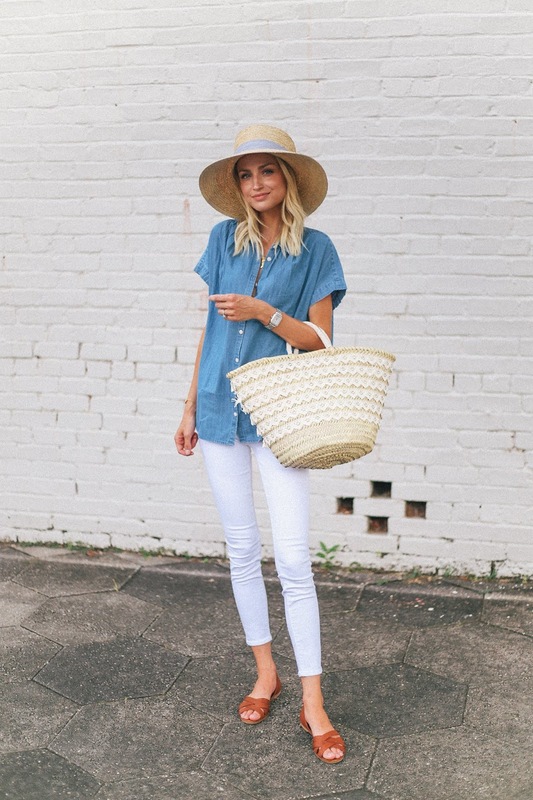 I wanted to share some really great basics and fun pieces to for a summer wardrobe you can mix and match. I'm tired of feeling like I need to find a new outfit for each outing, so I decided to work on a capsule wardrobe, if you will. First, I love to start with an inspiring direction. Sounds silly, but it helps me in my quest to find pieces that will all work together. Right now, I'm very into blue and white, neutral, classic, coastal, casual yet dressy attire. This way, when you're browsing you can obviously be drawn towards the items that you love, but you will have a better understanding of what flows together, and the particular items you need. 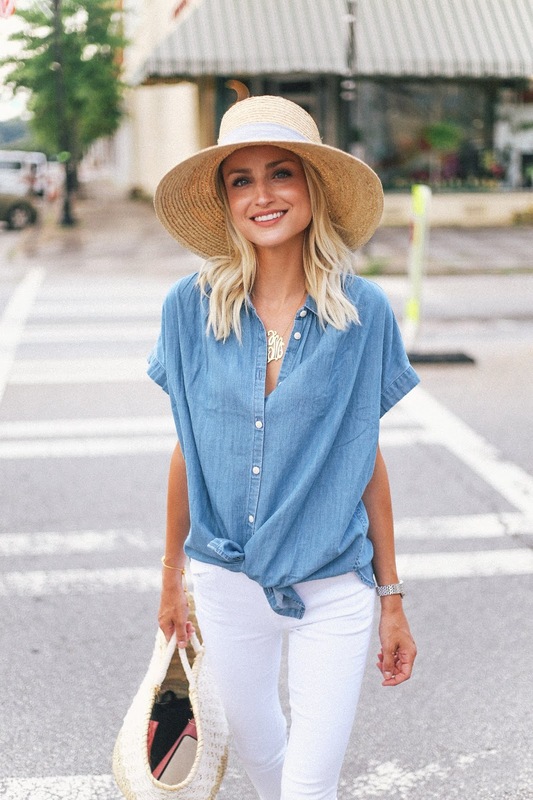 This chambray blouse from Madewell is the perfect top to add into your wardrobe. I can wear it loose, or tie up for a fun look with denim, but also with skirts and shorts... or even tie up with a dress! The relaxed fit works so well for the summer, and the fabric isn't too thick either. The summer sweater is another piece that we all know we need, but can be challenging to find the "right" one. When I've spent the day out in the sun, and the night is cooling off as the sun sets, I can't be the only one that reaches for a cozy sweater. I'm not talking winter, heavy and thick sweater. You know the one I'm talking about right? It's roomy, lightweight, and a super soft style knitted to perfection. This striped boatneck sweater from Vince was a splurge for me. I knew I wanted stripes, and I wanted something relaxed, yet still feminine. Honestly, this sweater is 100 times better than you can imagine when in person. I pulled it over my head and immediately... ALL OF THE HEART EYES. It's tailored to fit and pull into your waist a little bit, giving it a flattering style for something so relaxed. The boatneck makes me feel more polished, too. I also have this cute striped sweatshirt from J.Crew, and you probably remember this striped knit sweater from this post here. You can also use a basic white tank top for many outfits. I love mine paired with my denim shorts, these white jeans, my gingham tie front shorts, there are so many options to try. Wear alone, or throw over my favorite white fringe cardigan, or a chic printed scarf to complete the look. You can accessorize these basics any way your heart desires. I'm a huge fan of textured handbags. I love them in the fall, spring and summer! This one with embroidered lace trim is under $100 and such a fun bag to carry. You'll see me wearing this one, or my Pamela Munson tote on repeat (best investment!). More items on repeat as of late? This cute Lampshade hat, and these perfect gold stud earrings! I'm sure you've also noticed that I can't stop wearing these gingham flats from Kate Spade. If you aren't a fan of the slingback style or maybe the price point, I just found these cute gingham loafers, and a gingham d'Orsay flat option as well. Lastly, my lace smoking slipper espadrilles are always in the mix! 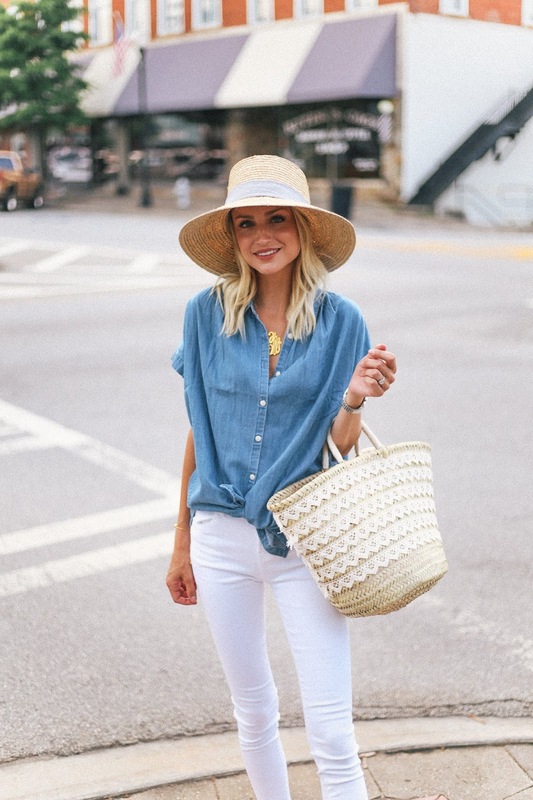 We can all agree that a good pair of white denim is a spring and summer closet essential. I've been wearing them more recently, and you can see these styled differently in another post on the blog here. This pair from JBrand is super soft, breathable, comfortable, and more importantly high waisted. I personally feel and look my best in high waist options, and I love that they are also cropped the perfect amount to wear with all different shoe options. Adding in my quality basics in a variety of neutral colors, worked best for me. For example, my all time favorite denim jacket, crisp white cardigan, and favorite distressed denim shorts. All of these pieces work perfectly with everything mentioned above! Anyways, that's all I've got for todays post, and I really hope you enjoyed it as much as I enjoyed creating it! Thank you so much for reading!